Meet the day-tripping dad behind the legendary ‘Amos’ bootleg tape of the Beatles’ final concert in Canada. Beatles Radio: The Beatles, Solos, Covers, Birthdays, News The Fab 4 and More! More remarkable than the admittedly poor audio quality of the performance itself is George Drynan’s off-the-cuff interviews with St. John Ambulance attendants and crowd members, all of whom assumed he was a reporter owing to his button-down appearance and professional manner. 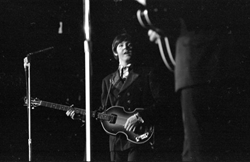 On Aug. 17, 1966, amid the din and hullabaloo of what would be the last-ever Beatles concert in Canada, nobody seems to have noticed the middle-aged man in the stands with a reel-to-reel tape recorder. He was George K. Drynan, QC, a day-tripping father of three, war veteran and sedan-owning Rotarian who travelled to Toronto’s Maple Leaf Gardens from Oshawa, Ont., with his wife – the accomplished organist, composer and choirmaster Margaret (Peggy) Drynan – and a family friend. The oldest son, John, handled the driving. Younger son James also attended the show, but had arranged separate transportation.